Themes about mothering and specifically the relationship between mothers and daughters tend to find their way into my creative work. Several of the stories, in the short story collection I am polishing, deeply explore the continuum of mothering relationships (e.g. biological moms, grandmothers, godmothers, aunties, etc.). 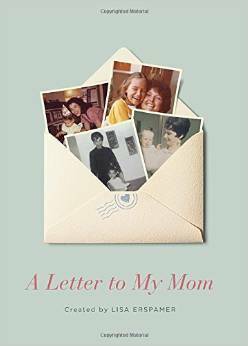 In my recent non-fiction work, I celebrate the courageous spirit of my mother in the just released A Letter to My Mom. In fiction, I love reading about mothering relationships that are a bit off balance, unusual or difficult. There are some mother characters that have stayed with me long after I put the book down. I’m thinking of the complex figure of ‘Elphaba’ in Gregory Maguire’s brilliant retelling of the Wicked Witch of Oz story in Wicked. Elphaba didn’t want to be a mother and for most of the book denies that she is responsible for Liir, a young boy. She is an absent, wayward and troubled mother. Although the second book, Son of a Witch, confirms that Liir is indeed Elphaba’s son, I appreciate how Maguire challenges ideas about the ability to mother as innate and easy. In Beauty, Sheri Tepper’s stunning mythic novel, the main character Beauty is half fairy and half human and is the important player in an elaborate effort to save humankind (although she does not know this at the beginning of the novel). Beauty is on a quest to find her mother (a fairy) who abandoned her when she was a baby. The novel begins in the 15th century and her journey propels Beauty through multiple time periods including the 20th century. Through Beauty’s quest, Tepper is able to have Beauty experience and shape key ‘fairy tales’ including Sleeping Beauty, Cinderella and Snow White. When Beauty finally finds her mother, she must confront her mother’s divided sympathies. This book takes up questions of loyalty, love and abandonment. Flight Behavior by Barbara Kingsolver tackles the question of: How do different people view an unusual event in nature? Is it a disaster? Is it a miracle? Is it a sign of life out of balance? Kingsolver explores these questions through the prisms of class, region, science, love, loyalty and family. Kingsolver’s main character, Dellarobia Turnbow, is someone who has been let down in many parts of her life. She got pregnant young, married the wrong guy, is tolerated by her in-laws, doesn’t like church and is constantly overwhelmed as a housewife and mother. The novel opens as she is about to take a drastic step to escape her unfulfilled life when she comes face to face with an experience that will shape and redefine her in unimaginable ways. This book provides some of the best descriptions of the physical and emotional labor of raising small children and how that often allows little time for self-introspection. I also love how trust and rapport develop between Dellarobia and her mother-in-law, Hester, who begins as an unsympathetic character. 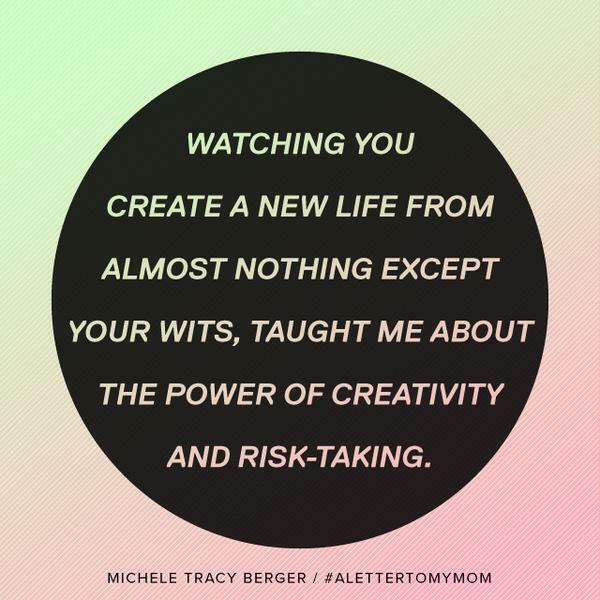 Do mother figures and/or themes about mothering show up in your creative work? If so, how? What are some of your favorite mother figures in fiction? I just received my beautiful copy of A Letter to My Mom! It is a tribute to the women who shape us into the people we become. My love letter to my courageous mother is next to letters from Suze Orman, Dr. Phil McGraw, Melissa Rivers, Lisa Ling, Dr. Jennifer Arnold and many other amazing sons and daughters. In this third installment of the A Letter to My series…(following A Letter to My Dog and A Letter to My Cat), over sixty contributors share letters that chronicle the love, gratitude, silliness, fun and even conflict that define mother and child relationships. I am honored to be part of this collection. My writing teacher, Marjorie Hudson (author of Accidental Birds in the Carolinas) encourages students to ‘find their territory’, to explore the kinds of unique themes and challenges that only they can write about. A Letter to My Mom is so inspiring and the layout of the book is beautiful. Each entry is accompanied by photos. It’s a great gift for Mother’s Day. Also, check out a GREAT contest to thank readers: A Mother’s Day Spa Giveaway! You can win a $250 spa day to spend with your mom! Want to write your own love letter to your mom? You can! They are looking for letters to post on the blog.